Some people enjoy dressing in the scariest costume they can find on Halloween, and others prefer wearing funny Halloween costumes like a peacock Halloween costume. Unique costumes come in every shape or size, and whether a person enjoys spooking others or making others laugh, there are plenty of ideas for unique and amusing Halloween attire. Halloween is the one night of the year when it's completely acceptable to dress as crazy or silly as possible. A pregnant nun and an adult dressed as a baby are just two examples of funny Halloween costumes that people commonly wear on October 31, with the hopes of achieving strange looks and responses from others. If the goal is to make people laugh so hard that they cry, however, a more unique costume may be in order. 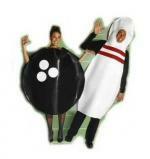 A bowling theme is a fun idea for couples or groups. It's sometimes difficult to come up with original and funny costume ideas. It's easy to visit a costume store like Party City, or shop for a funny costume online from stores such as Buy Costumes.com and HalloweenMart, but it's hard to come up with a unique and creative idea that nobody else will have.One of the secrets to ensuring a great and original funny costume for Halloween is to NOT wait until the last minute. For example, if a funny idea for a costume is discovered in August or September, either write it down or start working on the costume immediately. With a month or two of preparation time, you'll have plenty of time to find the perfect accessories for your costume. It's also a good idea to write down funny costume ideas that pop into your head early in the year, and put the note in a safe place. This is due to the fact that it's common to come up with the perfect costume idea and then forget about it by the time October rolls around. Dressing as a hamburger or a hot dog is funny. 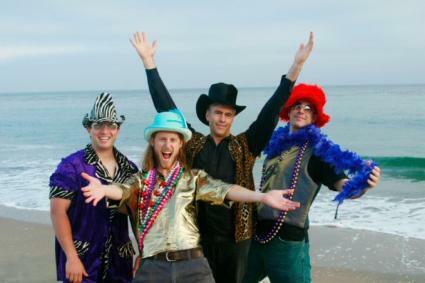 However, people may respond to these costumes by saying to themselves, "Been there… done that." You may want to try something more creative, so that people will be both entertained and impressed by what you are wearing. Thinking outside of the box in regard to these costumes means considering dressing as a meatless veggie burger or a half-eaten hotdog that's been left on a plate along with a few chips instead of the typical "hamburger" or "hot dog." Basically, taking a simple and typical costume and converting the costume into something a little bit outrageous is enough to make just about anyone laugh! A ghost wearing horn-rimed glasses. A school cafeteria lunch lady with a fork and knife sticking out of her hair. Dressing as food is always another funny Halloween costume idea, especially if the costume is edible. One idea for an edible costume is to dress as a gingerbread house covered in gumdrops and candy. Friends, party guests, and even strangers can help eat the costume right off! For those who aren't feeling very imaginative and need some ideas to get their creative juices flowing, here are two funny costume ideas. A Load of Laundry: This costume is pretty easy to make. All that is needed is an old laundry basket with a large hole cut in the bottom. The person who will be wearing the costume must step into the basket, and it can be secured to the body using some clothes line tied to the basket and suspended over the shoulders. The basket should then be filled with old clothes, an empty box of laundry detergent, and some dryer sheets. There is a hilarious "Woopie Cushion" costume for sale at Prank Place.Com. The costume looks like the real version that kids have enjoyed using for decades, and it is guaranteed to be the funniest costume anywhere in the vicinity.